I very much enjoyed playing QBEH-1, which we reviewed on it’s release last year. 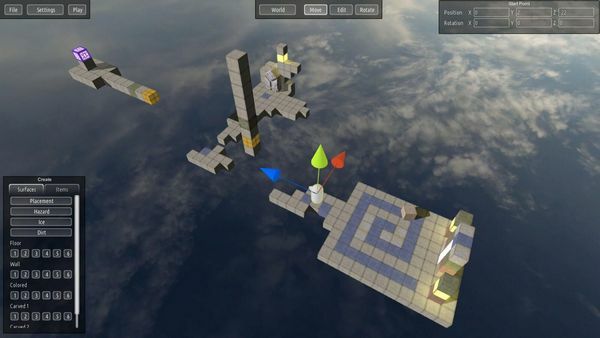 A relaxing 3D puzzle game – with some moments of vertigo and related tension – it involved progressing though several worlds, sometimes jumping from point to point but more often using various collected blocks in imaginative ways. At the time a level editor had been mentioned, and at times since then; an update today has finally added it, allowing players to create – and more importantly, share – their own designs. Part of me does wonder whether the game’s community will still be as focused as it might have been nearer to its release; but there is hope for seeing great creativity appearing, adding extra life to one of the most pleasant games I’ve encountered in recent years.